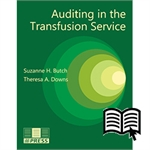 The quality plan in the transfusion service documents the structure, responsibilities, and processes and procedures to support the objective of safe transfusions. Audits are used as part of the quality assurance system to verify that systems function as intended and that requirements are met. This book describes how audits document compliance, enhance a quality system, and assist with error reduction. Some of the topics covered include auditing fundamentals, terminology, and types; audit preparation and planning; establishing an annual audit plan; auditor characteristics; collecting and documenting evidence; data analysis; and audit follow-up.